On Wednesday’s Mark Levin Show, Blaze TV Host Ben Ferguson fills in. 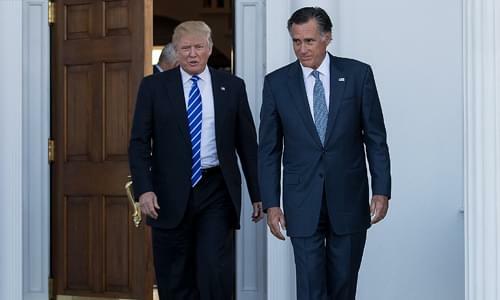 Two time loser and never-Trumper, Mitt Romney, who begged President Trump for a job took to The Washington Post with a self-serving Op-Ed sharply criticizing him. Romney ran for the senate just so he’d be relevant in the media and his first move, even before being sworn-in as a US Senator, was to rip Trump and placate to the left. As far back as 2004 Romney has been predictable and the establishment swamp loves predictability. Had Romney had this much courage and vigor during his own campaign for president, he might likely be sitting in the White House right now instead of being a useful idiot for the media. Also, a police officer who legally emigrated to the U.S was killed by an illegal immigrant last week. Too many media outlets omitted the fact that his killer was an illegal alien. So aren’t the democrat politicians support for these sanctuary city laws actually accomplices?